Namibia in southwest Africa has 3,700 square miles of diamond concession at sea, which is expected to yield millions of carats of marine gemstones for the next five decades. To ensure the vessels carrying out this mining are equipped, supply, installation and repair specialist, CP Automation, helped mitigate harmful harmonics on onboard the prestigious Debmar Pacific diamond mining vessel. Land-based diamonds in Namibia are expected to run out with the next decade. To avoid a shortage, the government of Namibia has been strengthening its offshore diamond mining capacity. In a joint venture between the Namibian government and De Beers Group, Debmarine Namibia, the country’s leading marine diamond mining company, was established in 2002. The company operates five diamond mining vessels including the Debmar Pacific, which mines diamonds from the ocean floor using advanced drill technology. Having been built in 1977, the Debmar Pacific was in urgent need of electrical system upgrading. Debmarine Namibia was having problems with a particular lighting circuit, in which several transformers were blowing due to suspected poor power quality supply. This is a classic symptom of an electrical circuit experiencing harmonic noise related problems. 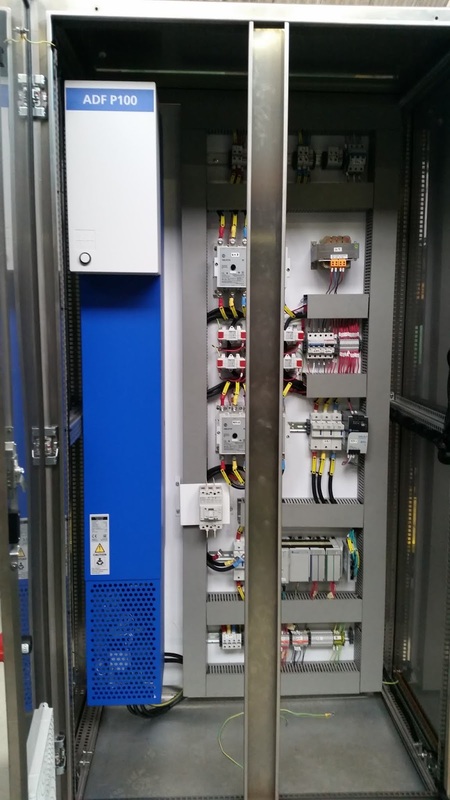 Actom Energy, electrical engineering specialist in South Africa, was chosen to design, manufacture and install an active harmonic filter control panel to the vessel to alleviate this problem. Actom needed to source a harmonic filter fast, and based on a recommendation from De Beers, called upon supply, installation and repair specialist, CP Automation. Using the information supplied by Actom and Deers, CP Automation advised the use of an ADF P100 active dynamic filter by Comsys. This problem generally arises from the use of variable frequency drives (VFDs) and other non-linear loads. A load is considered non-linear if its impedance changes with the applied voltage. This change means the current drawn by the non-linear load will not be sinusoidal, even when it is connected to a sinusoidal voltage. Non-sinusoidal loads contain harmonic currents that interact with the impedance of the power distribution system to create voltage distortion and power quality problems, which heat the transformer. This explains why the previous transformers broke in the lighting circuit on the Debmar Pacific. Harmonic filters — as the name suggests — remove harmonics. However, they also correct the phase of the fundamental currents, converting non-linear loads into linear ones. They cancel out the noise and keep the transformers cool and working efficiently. "We can’t stress enough how much of a positive impact the right harmonic filter can have on a company’s environmental performance, lowering energy consumption and improving productivity,” explained John Mitchell, business development manager at CP Automation. "With this in mind, we were confident the ADF P100 was a perfect match for Actom's project, and that it would put an end to the previous transformer issues." The ADF P100 active dynamic filter also brings the added benefits of a high-power density while being relatively small in size, which makes it ideal for small and medium size applications where space is precious, such as onboard a mining vessel. "We would certainly buy from CP Automation again," said Gregory Webb, instrumentation technician at Actom Energy. "Installing this filter was straight forward and engineer-friendly. It has continued to perform well since installation, as demonstrated by the lack of issues with the transformers in the lighting circuit, as we had seen before commissioning the harmonic filtering." The Debmar Pacific continues its operation off the southern coast of Namibia. To add to this fleet, the De Beers Group has since confirmed that the construction of the world's largest diamond mining vessel has commenced and will begin operation in 2021. This new vessel, along with the current Debmar fleet vessels, will make accessing the millions of carats of marine gemstones possible, with expert harmonic filtering onboard to ensure electrical systems are safe, trouble-free and long lasting. Namibia’s land-based diamond excavation may be reaching its end, but now, the country is taking diamond exploration offshore. With these vessels, the country can continue reaping the rewards of its lucrative diamond mining industry, without the limits of the land — or disruptive harmonics.